We were very busy this March: apparently, there is a momentum about meetups. Fembot held an editing event organized by the University of Maryland Department of Women's Studies, the University of Maryland Libraries, the LGBT Equity Center, and the Maryland Institute for Technology in the Humanities, to edit articles related to women of color, trans, and/or non-conforming people, Fembot Edit-a-Thon. Wikimedia DC and the Arlington Central Library held an editing workshop for Women's History Month. 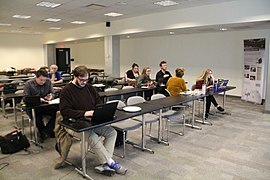 Wikimedia DC held a workshop co-hosted by student organizations iDiversity and Special Libraries Association @ UMD to improve Wikipedia coverage of disability justice. Art + Feminism and The Museum of Modern Art held a meetup, 2018 Wikipedia Edit-a-thon: Art + Feminism. Sarah Jaffe spoke. Wikimedia DC and the National Museum of Women in the Arts held a meetup, National Museum of Women in the Arts: Art+Feminism meetup. The event was covered in the Guardian "Wikipedia's forgotten women: inside the editing marathon to fix imbalance", and BBC "Women fighting for equality on Wikipedia"
Wikimedia DC and the Smithsonian American Art Museum held a meetup, DC Art and Feminism SAAM meetup. Massachusetts Institute of Technology Libraries held a meetup, MIT Art+Feminism 2018. Wikipedians of Los Angeles User Group held a meetup at Ace hotel, Wikipedia Day LA 2018. There was a presentation about Wikidata . There was a Wiki Edu panel with a discussion of incorporating Wikipedia into the classroom, with Dr. Karyl Ketchum from CSU Fullerton; Grace Gillies from UCLA; and Sarah Mojarad from USC. Wikimedia DC held a workshop with the Daughters of the American Revolution to improve or create articles about influential women in American history. Wikimedia DC held an editing workshop with the Washington chapter of the American Institute of Architects to improve or create articles about women architects. This page was last edited on 10 May 2018, at 11:31.